The multipurpose simulator provides an opportunity for visitors to try their hands at flying various airplanes. 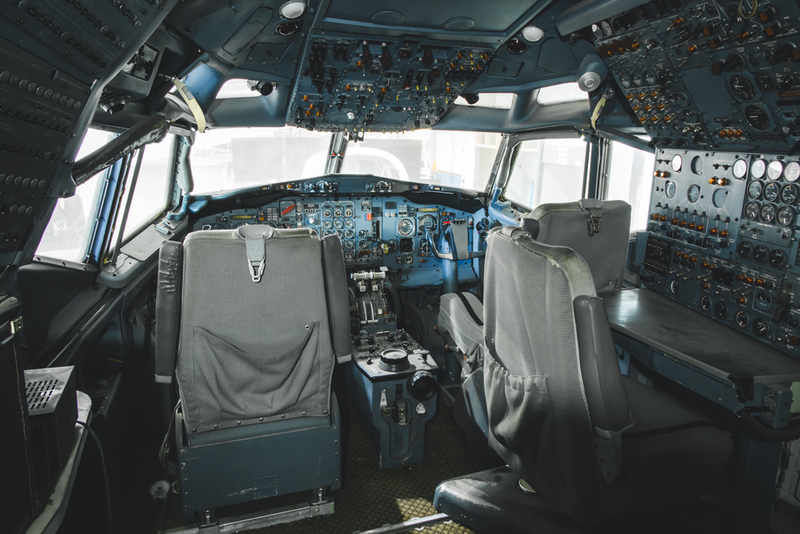 This pre-programmed unit, built for the Airline History Museum by Roger Dodger Aviation, can simulate aircraft ranging from WWI single engine bi-planes to modern day jumbo jets and supersonic fighters. More experienced simulator ‘pilots’ can even experience the thrill of ‘flying’ the Lockheed Super G Constellation N6937C. Early instrument flight trainers were purely mechanical devices. The most significant of these was the “Link Trainer” or “Blue Box” developed in the 1930’s by Edwin A. Link. These trainers were used extensively to train pilots in the basics of flight through the 1940’s. Dr. Richard Dehmel received a patent for an “Instrument Flight Duplicator” in 1950. This device was one of the first electronic flight trainers. It used electronic circuits to duplicate the aircraft’s response to control inputs. It also reproduced the “low frequency range signals, “automatic direction finder (ADF)” bearing information, and “Instrument Landing System (ILS)” localizer and glide slope signals. Dr. Dehmel licensed the Curtis Wright Corporation to build these devices; this one built in about 1953. This cockpit represents a generic single engine piston aircraft with instruments representative of state of the art aircraft of that time. The instructor sat outside the left rear of the trainer and used a control panel to set up the student’s flight conditions. A circular graph with a pen device was used to track the student’s progress during the training session. These devices were used extensively to train airline crews in instrument flight procedures until more sophisticated simulators became available in the late 1950’s.